After our lecture today, I did some reading about “Net neutrality”. Before I start talking about recent news and giving more detailed information about “Net neutrality”, I should explain and define what it is and why we all should care and know about it. For example: “Let’s say you use Hulu and Netflix, and often switch between the two to see what’s on. Supporters of net neutrality say that your broadband Internet service provider (ISP) should not be able to charge either Netflix or Hulu, or any other company that depends on the Internet, for a faster connection to you and other customers. Nor should the ISP be able to charge you more to access certain services.” (Trotter, J., K.) Meaning that network providers could choose to decide how fast data would be transmitted and at what quality. As a result it could come to unfair treatment and even discrimination as well as high prizes and a position of power for the providers. Because in that case some information would be accessed much slower than other, users would desire the information they have a fast access to and in the end, this way network providers could have a hand in creating monopoles or oligopolies. A neutral network might be designed without legal prodding – as in the original internet. In an ideal world, either competition or enlightened self-interest might drive carriers to design neutral networks. Lin, R., unknown. Network Neutrality. Available from: https://www.ocf.berkeley.edu/~raylin/whatisnetneutrality.htm [Accessed on: 25th March 2014]. Trotter, J., K., 2014. What is Net Neutrality and why should I care? The Non-Geek’s Guide. Available from: http://gawker.com/what-is-net-neturality-and-why-should-i-care-the-non-g-1657354551 [Accessed on: 25th March 2014]. The Guardian, 2015. Net neutrality. Available from: http://www.theguardian.com/technology/net-neutrality [Accessed on: 25th March 2014]. Baker, J., 2015. EU annoys industry and activists with net neutrality proposal. Available from: http://www.theregister.co.uk/2015/03/05/net_neutrality_eu_ministers_proposals_treated_with_suspicion/ [Accessed on: 25th March 2014]. After our meeting with Rob last Friday, I have been working on a “delete” and an “edit” button for the posts on our page. I knew it would be very similar to the code I had previously written for the “delete-account” button but also that I was faced with some complications. First of all, the users had to be able to only delete their own posts. For that, I knew I would need the “user_id” that I previously saved as a session variable, so I could run a query checking if the “id” from the user table would be the same as the “user_id” in the posts table. Luckily, at this point I had already managed to save the “user_id” from the SESSION in the posts table. That made this whole thing a bit simpler, because I did not have to take care of that in addition, but could just run a simple check to ensure that the two numbers were the same. Once that was accomplished, I thought about the second problem that I had to solve. At this point the user would click a button and end up deleting all of his posts no matter which button he picked (as long as it was one of his posts). That happened because the users “id” and the “user_id” from the posts table would be same for all the posts a user made. That meant that the “user_id” to select a certain post was not enough criteria and that I had to query for the post “id” as well. Also, in the following you can see a screenshot of the “posting-page” so far. All the posts with “edit” and “delete” buttons are the one made by the user logged in. In addition to the buttons’ obvious function, they are also an option for the user to keep track of their posts since they can easily get lost in the mass of anonymity and still stay anonymous (since other people can only see that certain posts were not made by them but not by who). Tina took on the task to find a name /logo for our website. Doing that, she asked the rest of the group if they had any ideas and then put together a Mind-Map. While our trip to the beach, we thought about maybe using something animal related, preferable the turtle since it is a sea animal, but we did not have a clear idea of what exactly. So, she made the Mind Map and then we talked a bit about what she thought of and we added some other possible ideas. The name was supposed to aim at students and we thought it would be nice to relate it somehow to “talking” since the whole idea is based around students sharing small stories. If you want to read more about that, you can look at Tina’s Blog that is references below. This post, I want to devote to explaining where we got our Inspiration from and talking a bit about the two applications. 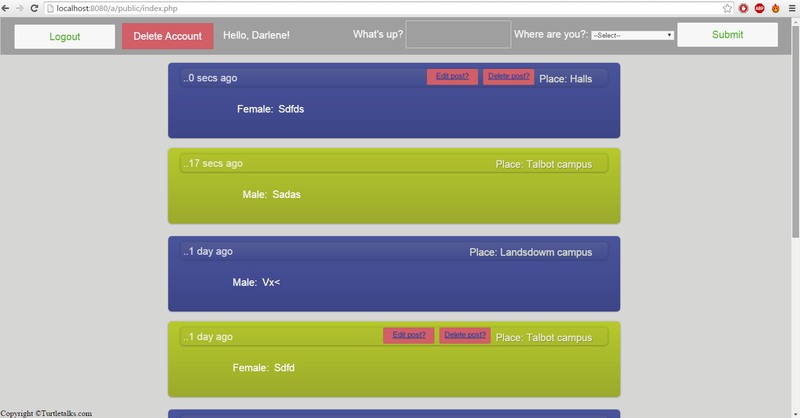 The very first idea of doing an anonymous Posting-Website for students was inspired by a German App called Yodel. It is not very well known in England, but a lot of my friends from home are using it to keep track of what is happening around them. The app is following a very similar concept to our website. Smartphone users can download it and then anonymously post and others can read those posts and rate them. The user only sees the posts from people close by, for example in their city. It is mostly used by people aged 18-25 to express their thoughts and ideas without sharing their true identity. YikYak was first launched in 2013 by Tyler Droll and Brooks Buffington. Both of them are graduates from a college in the US. The app allows people to create and view so called “Yaks” within a 10 mile radius. Just six months after the App was released, it became the 9th most downloaded app in the US. 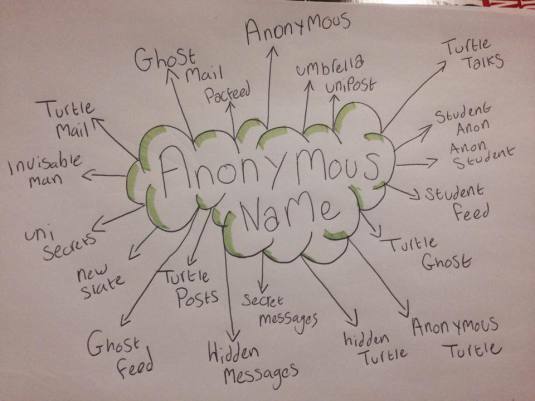 As in previous posts explained, for our project we have thought about an anonymous live tweeting website. This idea requires wider background research as well as the naming of inspirational websites/apps and looking into current debates about anonymity in the internet. First of all, let us look at pages that follow the concept of anonymity. One of them is called 4Chan.org. It was founded in October 2003 and is an English language, image based, message board with a simple design. On the site, users post anonymously images and comments across the 49 offered message boards. Most of them are dedicated to fandom cultures, like comic books, video games or anime as well as border interests like for example photography or fashion. To use the site, to post and comment, you are not required to set up an account. By now, there are nearly 18 million unique site visitors and over 730 pages viewed a month. Problem with this concept: Because users are able to hide behind the anonymity, a lot of 4Chans content is offensive, racist, homophobic and vulgar. None of the posters have to be afraid of consequences or a bad reputation and because of that they are not scared to say whatever comes to their mind. The question now is how we could prevent our ANONYMOUS-Website from turning into something uncontrollable with a lot of offensive content. We thought the fact that the posters have to set up an account even though they post anonymously might help. They are still able to write out their thought as they want to but they would also know that, in case of strong misuse, they would not be completely sheltered from possible consequences. Since we are planning to set up a University website, we thought of maybe requiring a Student ID for setting up an account. In case of offensive comments regarding the University or other students this might be an easy and effective way to enforce consequences. Today, we had our second group meeting, deciding on the final idea of our project and setting some goal we want to have reached by after reading week. Also, we decided on some task for each one individual. First of all, I am going to explain our project that we (so far) call the “anonymous Project”. 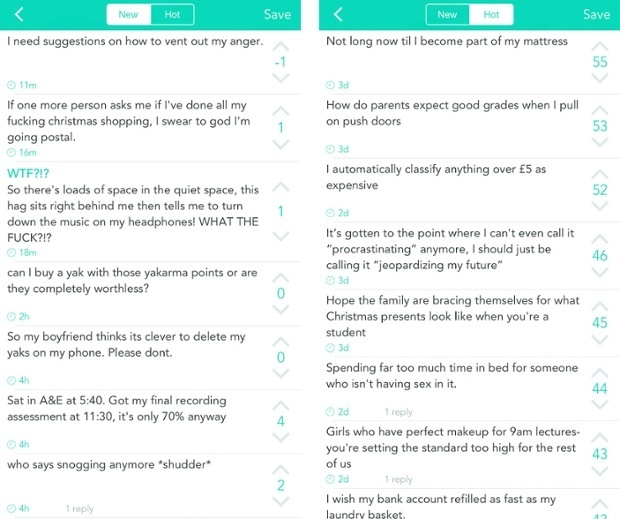 Idea: A place where University students can share ideas, experiences and mostly short stories or comments from their university and private life with a rating system that allows the readers to give positive or negative feedback. That concept may remind of social site like Facebook or Twitter. What we are going to do differently though is adding anonymity. The main idea of this project is creating a site where students will be able to talk freely without the intimidation of others knowing who they are. The users signs up. To do so, he names his year, name, gender and possibly Student ID (this would enable to track a user down in case of strong misuse. But it might also scare users off from sharing all of their thoughts, so we will still decide about that). It is important that the user will at this point be informed that that data is confidential and the posts will be anonymously whatever he enters. After that the user can use the page to either read and rank tweets or tweet himself. We thought about sorting them location wise, but we are not sure if we have enough knowledge to do so. We will have to do more research about that. The tweets will not contain the text, the gender of the person tweeting, their year of study (and maybe location). The user logs out, he returns to the sign-up/login page. After we reviewed that idea and decided that we all agreed on where we were, we set individual tasks, each one of us should try and complete until after reading week, since we would not be able to meet during. I was supposed to create the first version of the tweeting/login page. That means a basic layout, the tweet/login/register forms and the PHP that was needed to connect to the database. Rebecca was supposed to create a “About the team page” and think about a possible official name/logo for the project. Also, she would take care of the navigation bar. And Israfiel was supposed to put a “about BU/Bournemouth” page together since we are planning to create the page for BU in particular.